Church life from the beginning has been plagued by internal tensions, quarrelling and public fights that demoralize its members and undermine its mission. Just read St Paul’s letters to the Corinthians and you get some sense of the troubles he faced. Factionalism. Social cliques. People taking sides and magnifying their petty liturgical and theological disputes. Sexual misconduct. Overblown parish pride. Big talkers who didn’t deliver. Indifference to people in need. Disputes over Paul’s teaching and authority. And that was around 50 AD in a Christian community that was probably no more than fifty people! Even the saints sometimes have trouble getting along. St Paul and St Barnabas had to split up their mission and go in different directions after “a sharp contention” when they couldn’t agree on taking young John Mark with them (Acts 15:36-41). Two different leadership styles collided. John Mark had failed the mission before when he left prematurely to go home (Acts 13:13) and St Paul, focusing on the mission’s objectives, was unwilling to have a weak link who couldn’t do the work. St Barnabas may have given more importance to the long-term relationship and mentoring the young man. Whatever the issue, it was enough for the two saints to get really mad at each other, at least for a time. This dispute was surely distressing for everyone else too, but they took it in stride as just part of normal human life, even among Christians. So both were “commended by the brethren to the grace of the Lord” (Acts 15:40) as they went their separate ways to proclaim the word of the Lord and strengthen the brethren. We find this pattern repeated from century to century, from culture to culture “wherever two or three are gathered.” There are always plenty of legitimate reasons that a faithful Christian would just get tired of the mess, throw up his hands and walk away. Or try to find some other religious community where “it’s not like that.” Good luck. Quakers are known to specialize in being peacemakers, but their own communities are not immune to disputes as I’ve learned from Quaker friends (to their credit they have well-developed procedures for dealing with congregational conflicts, and we Orthodox could learn from them). Buddhism too is reputed to be a conflict-free zone, but when I recently attended a training seminar for church leaders on handling sexual misconduct, two Buddhist nuns were there as well, because one of their male leaders had stepped over the line and in the aftermath the community had been devastated and divided. Burnout may be what the classic spiritual writers call “acedia,” despondency, despair, restlessness, no longer caring about anything or anyone, feeling nothing during prayer, not wanting to pray, a sense of hopelessness, that there is no purpose in our life and no way out. The spiritual teachers of the ancient church advised fighting this “demon of despondency” with psalms, a firm hope in future blessings and sticking to a routine of regular work. The cure may not be especially complicated. We may need someone just to listen to us and acknowledge our sense of overwork, betrayal or hurt. We may need just a dose of being human. A priest I know once went to the great monastic center on Mt Athos in Greece and was speaking with an elderly monk about being in such a state. After listening to his woes the monk went to a cupboard and brought out a box of chocolates. “Here, I think you need these. And you need a rest. Take your wife on a vacation.” This is similar to the advice St Thomas Aquinas gave in the 13th century: a hot bath, a glass of wine and a good night’s sleep. We also need to be aware that what we may label as burnout may in fact be clinical depression. When we are “feeling blue,” especially over a long period of time, we may think we are merely suffering the slings and arrows of normal life, including normal church life. But we may have a serious ailment that needs medical attention as well as spiritual counsel. How do we minister to someone who has gone past the burnout post, and left the church? I’m ashamed to say that there are people who have quietly stopped coming to church and I just didn’t follow up. I got caught in day-to-day busy-ness and they fell to the bottom of the to-do list. Parishes can get everyone involved to follow up and prevent this scenario, but it happens and it’s sad. Not everyone with burnout will be open to a visit or a conversation, but most are. Sometimes the burnout comes from a genuine crisis of faith. Perhaps they haven’t had a chance to talk about their troubles seriously, or they were afraid of talking about it. Maybe they don’t have the words they need to have this sort of conversation. Or they’re afraid of being pushed into a corner. We need to share our own uncertainties and disappointments, but also why we stay in the face of them. Or perhaps they drift away because competing demands keep them from an active spiritual life, and “as they go on their way they are choked by the cares and riches and pleasures of life, and their fruit does not mature” (Luke 8:14). Others may feel lonely and no one in the church notices. For them it’s not so much a crisis of faith as a crisis of love. Sometimes they leave because they became so active in church life that important aspects of their family life got neglected (a priest recently told me that priests regularly break the Ten Commandments because they steal: they steal from the time that belongs to their wife and children). It is guaranteed that we will face situations in church that will push all our burnout buttons. The question is, will we be a torchbearer or a burned-out leaver? Maybe we’ll be both, leaving for a time, and then coming back after discovering—or rediscovering—that there is a lot more in the life of the church than meets the eye. “With men this is impossible, but with God all things are possible” (Matthew 19:26). An excellent reflection on this whole subject is Kathleen Norris, Acedia and Me: A Marriage, Monks and a Writer’s Life (2008).See also Fr Gabriel Bunge, Despondency: the Spiritual Teaching of Evagrius Ponticus , (SVS Press, 2011). This entry was posted on Tuesday, June 19th, 2012 at 12:06 am and is filed under Uncategorized. You can follow any responses to this entry through the RSS 2.0 feed. You can skip to the end and leave a response. Pinging is currently not allowed. Very insightful presentation of value to individuals and parishes. Most if not all have had similar experiences both personally and as observers. And truly as Father writes, with God there are no limits to the possibilities of what we can accomplish in witnessing for Christ. Thank you. Phrase should have been no limits, please correct. Thanks. God always provides exactly what we need. I’ve dedinitely been struggling with burnout lately with church, work, and family. I just finished saying my evening prayers and was asking Godd to help me with this struggle. Sure enough I felt something tell me I should look up today’s scripture on oca.org. It’s something I’ve been neglecting lately, but I’m so glad I listened to that little voice because I found this blog. It helped a lot to know I’m not the only one to experience this and to know that God will help me get back on track. Thank you Fr. Jillions. I really appreciate the spiritual guidance. Thank you for making the effort at a pastoral response to what you describe as “church burnout”. As a former Roman priest and a recent convert to Holy Orthodoxy, I was surprised and dismayed by your overall approach to the issue as well as your reference to Teresa of Avila, Amy Grant, and Thomas Aquinas as sources of emulation and inspiration without any mention of Orthodox saints and ancient fathers of the Church. It seems to me as an Orthodox Christian we should take our inspiration and guidance from within the One, Holy, Catholic, and Apostolic faith that is Orthodoxy. The very word Orthodox signifies a right belief that leads to right worship. Why would one ignore what we purported profess and believe to be the truth when discussing spiritual matters? 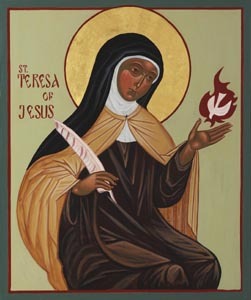 While my concerns with your blog post are too numerous to delve into in any great detail, I’d like to mention them in brief before addressing my issues with your references to Teresa of Avila and Thomas Aquinas. 2) Church life is not about internal tensions, quarrelling, public fights, factionalism, social cliques, or overblown parish pride, and any attempt to normalize them seems misguided. Rather, the Church is a hospital for souls where sinners submit themselves to the process of purification, illumination, and deification through the work of the Holy Spirit. 3 )Burnout is not acedia and is not remedied by finding a sympathetic ear or a shoulder to cry on. These issues are addressed by the ancient fathers and contemporary “friends of God” such as Elder Paisios, who instead consistently counsel self-reproach, remembrance of God, and the cultivation of a humble heart. 4) Leaving the church is not the equivalent of leaving a restaurant after an unpleasant meal. Leaving the church has eternal spiritual consequences. At the end of each Divine Liturgy we pray, “We have seen the true light; we have received the heavenly Spirit; we have found the true faith, worshiping the undivided Trinity, for the Trinity has saved us.” What possible excuse could one offer for walking away from that? I apologize for this lengthy response to your blog post. However, there are important distinctions to be made. I didn’t leave the Roman church because I was “burned out” or could no longer serve as a married priest. I left because I found the truth and the way to salvation. As an Orthodox Christian, I have left behind the errors of Teresa and Thomas as well as the foolish, cotton candy pop Christianity of Amy Grant. I have received the heavenly Spirit; I have found the true faith, worshiping the undivided Trinity, for the Trinity is working to save me.